Ever ask what 20/20 eyesight really means? 20/20 vision is a term used to express normal visual acuity or sharpness of vision. In other words an individual with such visual acuity will be able to clearly see an object from 20 feet away which is deemed normal to see clearly from that distance. In cases of individuals that don't have 20/20 vision, the number is determined based on where they begin to see clearly compared to the norm. As an example, if your acuity is 20/100 that means that at 20 feet you can only see an object that a person with normal vision can see at 100 feet away. It's also possible to have better than 20/20 vision. For example a person that has 20/10 eyesight can see clearly at 20 feet what most can only see at 10 feet distance. Certain animals have more acute eyesight in comparison to what humans are capable of. A hawk for example can have 20/2 vision, enabling them to locate prey from great heights. A typical vision screening is done with the use of an eye chart most commonly the classic Snellen eye chart created by Dutch eye doctor, Herman Snellen in the mid-1800's. While today there are quite a few versions, the chart usually has 11 lines with uppercase letters which get progressively smaller as they move toward the bottom. The chart begins with one capital letter – ''E'' with letters being added subsequently as you move down the chart. During the vision test, the optometrist will look for the line with the smallest lettering you can read. Each line is given a rating, with the 20/20 line typically being ascribed the eighth row. For young children, illiterate or disabled persons who can not read or vocalize letters, the ''Tumbling E'' chart is used. At the same scale as the traditional Snellen chart, this version shows only the uppercase letter E in different spatial orientations. The patient uses their hand to indicate the rotational direction the ''fingers'' of the E are pointing: right, left up or down. Both charts must be positioned at a distance of 20 feet from where the patient is viewing it. Despite common perception, 20/20 vision does not indicate a person has flawless vision but only that they see adequately at a distance. Complete vision involves many other important skills such as side or peripheral vision, perception of depth, color vision, near vision and focusing and coordination between the eyes amongst others. It's important to remember that even though an eye exam with an eye chart will establish if you require a visual aid to improve distance vision it will not give the eye doctor a comprehensive understanding of the complete health of your eyes and vision. Make sure you still schedule a yearly comprehensive eye exam which can identify potential conditions. 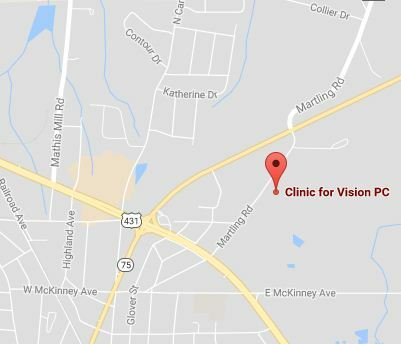 Contact us today to schedule a Albertville, AL eye test.